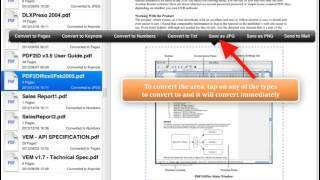 Learn how to convert a selected area of a PDF to Pages, Numbers, Keynote, JPEG, PNG, Excel, PowerPoint, Word and OmniGraffle and other types using PDF2Office for iPad. 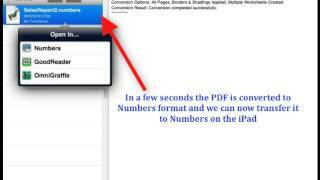 With this tutorial, we want to show how easy its is to extract data or convert specific areas of a page of a PDF file on the iPad using PDF2Office for iPad. Here we have the PDF2Office for iWork running on the iPad with a PDF file that is being previewed. Previewing a PDF file is really easy. Just tap on the file name in the Documents list and presto you can view it. Now what we’re going to do is mark an area convert it to a specific format. What we want to do is navigate to the page we want to convert. So we swipe to the page in the Preview area. Then tap on the Area select tool located in the Tools area. The area select tool allows you to mark a rectangular area to convert immediately. I simply draw a rectangle around the area I want to convert. You notice immediately that a whole bunch of formats to convert to appear. I can convert to Pages, Numbers, Keynote, Text and even save the selected area as a JPEG or PNG image or send the enclosed area to Mail. Lets convert the marked area to the JPEG format. So, we tap Save as JPG and the selected area is immediately converted to a JPEG format. We can now transfer this to the Photos Library or transfer it to another application on the iPad that can view and manipulate JPEGs or send it as an attachment in a new mail. PDF2Office for iPad, is available in 3 editions from the App Store. There is PDF2Office Business which converts PDF to Excel, Word, PowerPoint and OmniGraffle formats. PDF2Office for iWork which we are using and PDF2Office Lite which converts to RTF and Text formats.